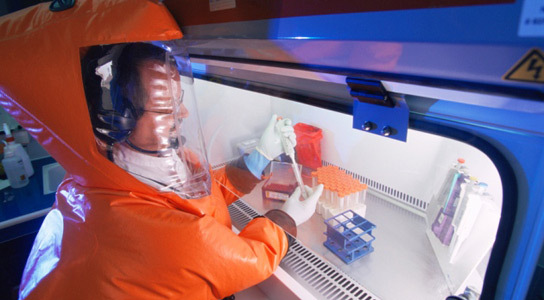 US authorities may hike biosecurity requirements for some avian flu research. Image by Philippe Psaila/SPL. U.S. Federal health agencies have started to tighten security surrounding the research on deadly pathogens. The move is to enhance public safety, but some fear that this might hamper research. Earlier this month, US health agencies added SARS to the list of select agents that pose a sever threat to public health and safety. The agencies opened public consultation about whether H5N1 should also be listed as a Tier 1 agent. SARS, as well as two new hemorrhagic-fever viruses, Lujo and Chapare, will be on the Tier 1 list, meaning that dozens of US labs holding the virus have until April 3rd to upgrade their biosecurity measures or destroy or transfer them. 38 of these labs do not have the extra security measures to carry out select-agent research. These measures include stricter lab-access rules and the vetting of staff. These restrictions could interfere with the sharing of the virus or reagents between labs in the USA and overseas. The restrictions come in the wake of a moratorium on flu research, which could potentially lead to an uncontrolled pandemic. The new rules include extra physical barriers, video surveillance, and stricter staff vetting and monitoring. The Tier 1 subset includes pathogens responsible for smallpox, Ebola, anthrax, foot-and-mouth disease, and rinderpest. If the new restrictions for H5N1 are imposed, it’s likely to influence the way that research is regulated globally, since the US is the largest funder of flu-related work. Be the first to comment on "US Concerns about Biosecurity Could Hamper Collaborations in Viral Research"